Bernard Laporte has raised the stakes in a bitter war of words over the destiny of the 2023 tournament. 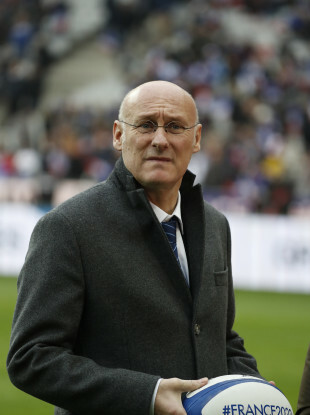 Bernard Laporte President of the French Rugby Federation (file pic). FRENCH RUGBY CHIEF Bernard Laporte has raised the stakes in a bitter war of words over the destiny of the 2023 World Cup on Tuesday by saying the sport risks being seen as weak over doping. Last week, the Rugby World Cup Board recommended the World Rugby Council award the tournament to South Africa after a technical report placed it ahead of rival bidders France and Ireland on an overall score across a range of criteria. That prompted a furious response from Laporte, the president of the French Rugby Federation (FFR), who said the organisation would be writing to World Rugby chairman Bill Beaumont seeking a correction over what they said were a series of inaccuracies, including the quality of stadiums and hotels, ahead of next week’s final vote on the 2023 hosts. Laporte went further in an interview with Britain’s Times newspaper published on Tuesday, highlighting a section of the World Rugby report that says “there is a potential risk related to the criminality of anti-doping violations in France” because the government had not guaranteed an exemption for players. “France is the leader in the crackdown and fight against doping worldwide,” Laporte said. “If the World Anti-Doping Agency (WADA) sees this report, they will not believe it. It is laughable. When you read a statement like that you allow for doping being acceptable and leaving the door open to abuse,” added Laporte. He also called on World Rugby to issue a list of corrections so voters had “accurate information, saying that while he was “not doubting the good faith” of the report’s authors, their findings contained a “certain amount of incompetence”. But a World Rugby spokesman told AFP in London later Tuesday had no intention of seeking an exemption from French law and that they were committed to the fight against doping in sport. “We understand that emotion is high and that some people are disappointed to read the contents of this exhaustive, objective and independently-audited report, but those comments are not a fair reflection of the situation,” the spokesman said. “The fact is World Rugby is not seeking an exemption for players from French law. Both South Africa, in 1995, and France, in 2007, have previously staged the World Cup outright. Ireland are bidding to be the main hosts for the first time, although they did stage matches as part of the 1991 and 1999 editions. The aim of the report was to give voters an objective guide and prevent the kind of backroom deal-making that had been a factor in previous World Cup host decisions. But its publication has proved controversial, with Irish officials unhappy at coming third with a score of 72.25 compared to 75.88 for France and 78.97 for South Africa in what they have since said was a “skewed” system. The World Rugby Council will make the final decision in London on 15 November. Email “World Cup report leaves 'door open to drug abuse' ”. Feedback on “World Cup report leaves 'door open to drug abuse' ”.